To order any Xenca products, which can be posted directly to many different countries, please click here. Wouldn’t it be good if the beauty products we put on our face were kind to our skin, free from harsh chemicals, AND really worked? Xenca think so too! That’s why their Eternity skin care range is free from parabens, petrochemicals, glycols and synthetic fragrances and packed instead with natural, skin-soothing ingredients that deliver outstanding performance. We think you’ll love Xenca’s kind and pampering formulas and that the results will speak for themselves. Here is a link to some skin care product reviews that might be worth checking out. 2. Gentle, effective, non-greasy formulations. 4. Free from parabens, petrochemicals and glycols. 5. Free from synthetic fragrances. 6. Non-comedogenic (will not clog pores). 7. Suitable for all ages and all skin types. 8. Value for money: generous sizes and moderate prices. 10. British brand, manufactured in the UK. 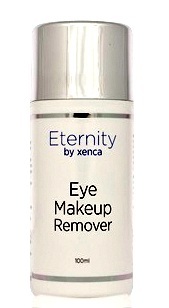 Xenca’s gentle yet effective Eye Makeup Remover will thoroughly cleanse and remove all traces of eye makeup, including waterproof products, whilst soothing and refreshing the delicate skin around the eyes. The fragrance-free formulation incorporates rose water to moisturise, tone and smooth the skin and refreshing cucumber extract to soothe, cool and reduce puffiness. 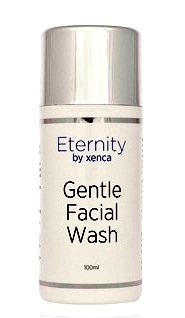 The finest skin-soothing and purifying ingredients of allantoin, Aloe Vera and cucumber extract make Xenca’s lightly foaming soap-free Facial Wash a simple and gently refreshing way to remove all traces of dirt, oil and makeup without clogging pores. This wash-off cleanser is pH balanced and is suitable for all skin types. 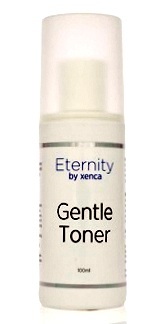 This light, refreshing toner has been formulated to remove all impurities and traces of cleanser whilst normalising the pH balance of the skin. It has been mildly medicated to relieve inflammation and minor skin damage, thanks to its various herbal extracts including refreshing rose flower water, witch hazel and allantoin. 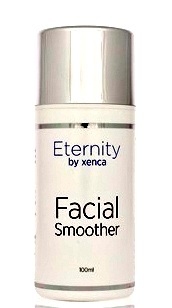 A unique blend of natural exfoliants in a soothing moisturiser, Xenca’s Facial Smoother gently removes dead skin cells, revealing soft new skin for a younger, healthier appearance. Finely crushed pumice and jojoba beads, suspended in a calming concoction of Aloe Vera, orange flower water and sweet almond and apricot kernel oils, provide a mildly abrasive action, leaving skin feeling super-smooth and hydrated. Non greasy and easily absorbed, Xenca’s Eye Contouring Gel is formulated to relax, tone, cool and soothe the delicate skin around the eyes without clogging pores. The combination of Aloe Vera gel, witch hazel, rose flower water and extracts of comfrey and cucumber alleviates fine lines and signs of tiredness, leaving eyes looking and feeling refreshed. 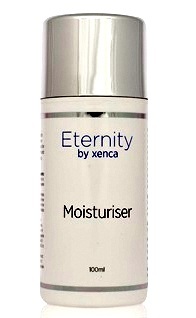 Blended with rosehip and wheat germ oils, extracts of Aloe Vera and rose geranium, as well as vitamins A, E and B5, Xenca’s light, non-greasy Moisturiser delivers a host of natural skin-calming and skin-saving benefits. It allows your skin to feel soothed, healed and moisturised when worn alone or under makeup. It is suitable for all skin types, including teenage skin, and will not clog pores. 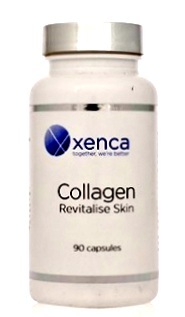 Formulated with hyaluronic acid, zinc and vitamins A, C and E, this collagen supplement is designed to combat the visible signs of ageing. Both collagen and hyaluronic acid are abundant in the human body and play a crucial role in keeping our skin looking and feeling young. However, depletion over time results in loss of firmness and moisture and the appearance of fine lines and wrinkles. 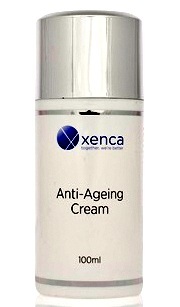 Camouflage the age of your skin and reverse the signs of ageing with Xenca’s incredible Anti-Ageing Cream. Formulated with collagen, hyaluronic acid, shea butter and zinc to help your skin look and feel younger, this exceptional product also contains Acetyl Hexapeptide-3, a unique new anti-wrinkle peptide that has been scientifically proven to help reduce the development of wrinkles. Studies have shown up to a 17% reduction in wrinkle depth after 15 days of use (with 10% Acetyl Hexapeptide-3). A luxurious blend of gentle scrub materials in a fragrant body moisturiser. If you want to know more about the Eternity Skin Care range, or other products of course, please feel free to contact us. Hi. Is this product available in Canada?